There really is a safe, natural and extremely effective way to take charge and positively impact every aspect of your child’s life. It doesn’t take medicine, therapy, harsh actions, or cajoling your kids to change their behavior. Instead, it is teaching your kids self-discipline, hard work, confidence, and respect. This done in a way that empowers them while also teaching them humility, and promoting health and fitness… all at the same time. Sounds like a wonder cure doesn’t it? It’s common for a kid who performs poorly in class to start thinking that they’re not capable of doing better. Disappointments can dampen enthusiasm for learning. In our martial arts school, kids learn how to take hits – and they carry the ability to do so in the classroom, where they can cope with setbacks and learn that hard work can help them more forward. The persistence and discipline that kids learn in martial arts classes is something that applies directly to their education. Instead of giving into the moodiness and attitude, take them to our martial arts school instead! Teenagers are smart and capable – but they can also be their own worst enemies. Between peer pressure, their innate urge to rebel against their parents, and their surging hormones, they can be impossible to be around. But all they need is an outlet for their frustrations – and an opportunity to learn how to be their best. In our martial arts school, respect is a core discipline. Students must treat their sensei and fellow students with respect at all times. Whether they’re in a martial arts class or in a competition, the difference between a good performance and a poor one often comes down to judgment. Students learn how to make judgments on the fly using the information they have on hand in conjunction with their training.They also learn how to differentiate between good instincts and bad ones – and to use that information to make judgments. Teens sometimes seem not to care about setting goals either in the short-term or the long-term. The study of martial arts requires them to pursue goals on a regular basis. Each skill they learn, and each belt they earn, represents a goal that they have achieved. Goal-setting in this way provides teens with the tools they need to set achievable goals in school, at home, and in life. Brazilian Jiu Jitsu is an intense, aerobic and anaerobic workout that helps any child’s fitness and health improve. It is a fun exercise for children to develop body coordination as well as personal development and growth. 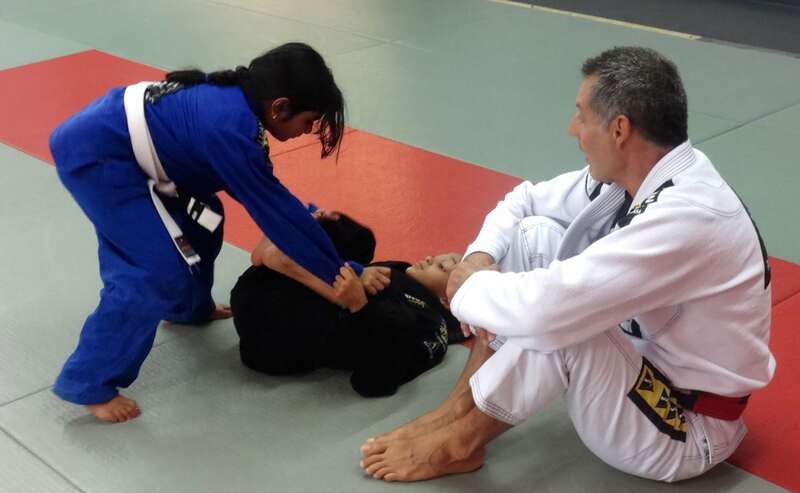 The benefits of Brazilian Jiu Jitsu goes above and beyond any other martial art due to its adaptability in the skills and techniques that a child learns to takedown an opponent. Training in Brazilian Jiu Jitsu takes many people out of their comfort zones because it is based solely on avoiding kicking and punching and little violence. Brazilian Jiu Jitsu uses a variety of joint locks, chokes, holds and throws instead of the basic punches and kicks. Many children have to focus for extended periods of time since they are training against a resisting partner instead of a paddle or bag. This helps with a child’s thinking process, problem solving skills, coordination, and physical awareness. 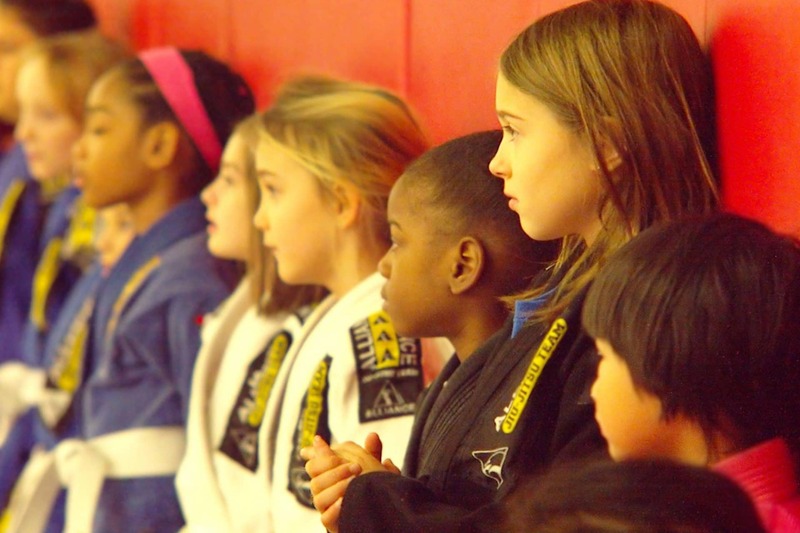 Brazilian Jiu Jitsu also helps students at Alliance Jiu-Jitsu learn self-discipline, respect, and focus. Many parents at Alliance of Atlanta see an improvement in their child’s increased attention span and focus in school. Alliance Jiu-Jitsu is dedicated to empowering you or your child with the confidence and self-esteem needed to succeed in everyday life. 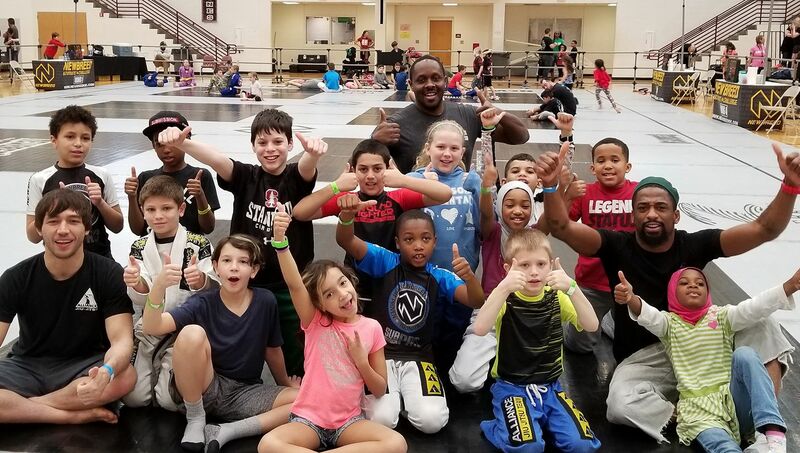 Brazilian Jiu Jitsu can bring out the positive qualities that have always been a part of you or your child, whether that is inner calm, positive mental attitude, patience, or self-discipline. Brazilian Jiu Jitsu will help you overcome obstacles, anger and self-doubt, and leave you feeling confident in any situation. Brazilian Jiu Jitsu is a total body workout because it involves your entire body to to protect yourself against another person trying to take you down. At Alliance, we know the importance of a healthy mind and body. Child-obesity is a serious problem in the United States, so introducing your child to martial arts is a great way to combat that. In Brazilian Jiu Jitsu, you’ll burn hundreds of calories in each class, develop lean muscles, and boost stamina. Brazilian Jiu Jitsu is a high-energy training class that is great for overall health and weight loss. Many parents also choose to enroll their children in Brazilian Jiu Jitsu because it is a great opportunity to make friends. In BJJ you need to have a training partner to practice with, so you spend a lot of time with that person. You can’t learn BJJ by yourself and cannot learn the martial art by using paddles or punching bags. You need someone to grapple with and create a bond of trust and reciprocation. You and your partner will motivate and push each other so you know if the new joint lock or throw you learned actually works on an opponent. Members at Alliance have become close friends and help each other refine their skills and reach their goals. Learning Jiu-Jitsu at Alliance will benefit you and your child immensely. BJJ helps build mental toughness, teaches the value of hard work, and gives you the persistence you need in everyday life. 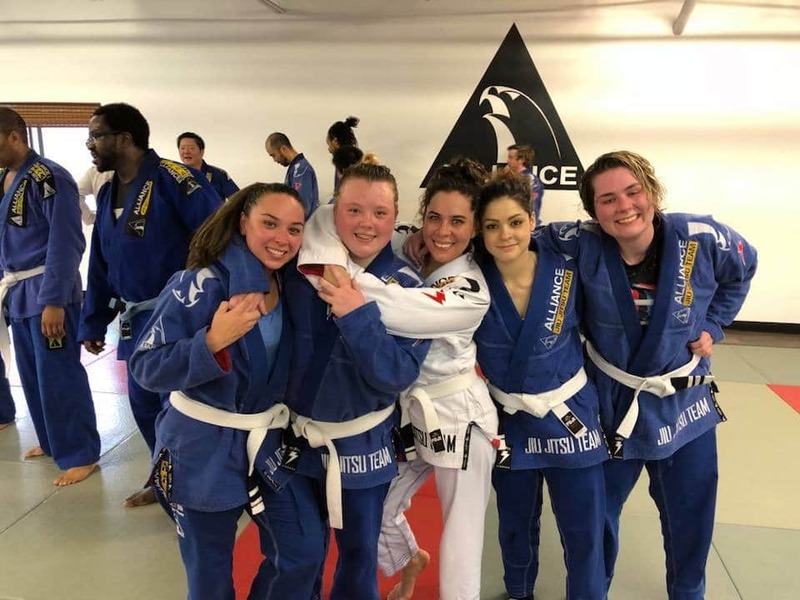 Many members at Alliance have said that BJJ is also a great stress-relief from school or work because it helps take their mind off problems they are facing so they can focus all their strength and thoughts into grappling on the mats. 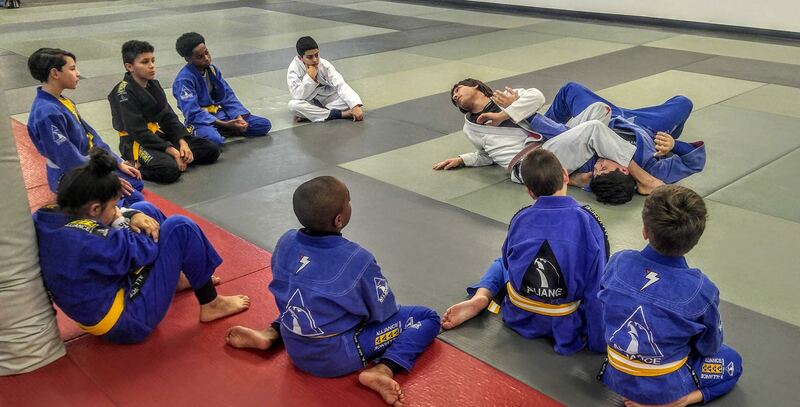 Brazilian Jiu Jitsu at Alliance in Atlanta is also a great way to help your child with developmental life-skills. It puts them in an atmosphere where they overcome obstacles, gain self-esteem, can succeed, and learn to never give up. Bullying in schools has become an ever-increasing problem, so giving your child the skills they need to feel confident in redirection and assertiveness. Our students at Alliance Jiu-Jitsu are taught how to redirect verbal assaults and assess situations without needing to physically use their skills.